Massachusetts beach and ocean resorts are a great choice for a family vacation or a romantic weekend getaway or any trip of any description. 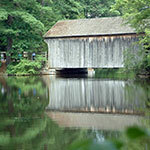 The first places that spring to mind are Cape Cod and the islands of Martha's Vineyard and Nanatucket. Several luxury and family-oriented resorts greet vacationers, including the Wequasset Resort and Ocean Edge resorts on Cape Cod; the Winnetu resort on Martha's Vineyard; and the TheWauwinet and White Elephant on Nantucket. Elsewhere, Gloucester and Rockport North of Boston and Hull and Plymouth South of Boston have resorts with luxury spas , fine dining, water sports and family fun. This Cape Cod waterfront lodging features comfortable accommodations, modern amenities and activities for the whole family including a private boating beach with ramp and dock, free use of rowboats and paddleboats, heated outdoor pool, barbecue grills all set on a beautiful ocean inlet. 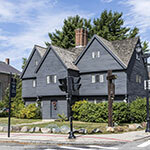 Nearby are popular local attractions including Plymouth Rock, Martha’s Vineyard, sun-drenched sandy beaches, golf courses, and the best Cape Cod fishing. 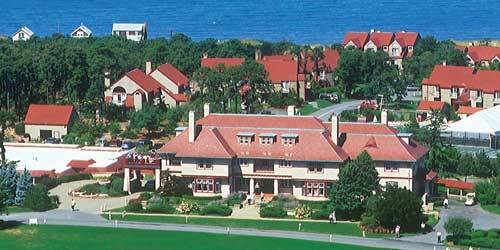 There’s whale watching and the Woods Hole Oceanographic Institute for some out of the ordinary vacation fun. 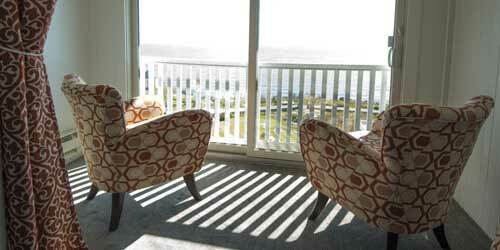 All waterfront rentals feature a slider to a balcony or patio. Each waterfront guest room is heated and air conditioned with private bath, tub and shower, cable TV, microwave, refrigerator and coffee maker, and free high-speed wireless Internet access. 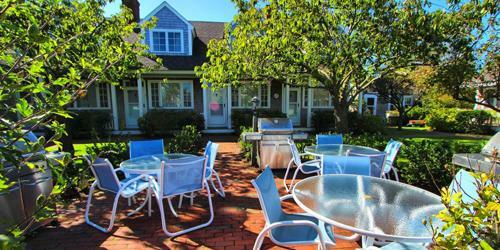 Winnetu Oceanside Resort is located 250 yards from South Beach, Edgartown. 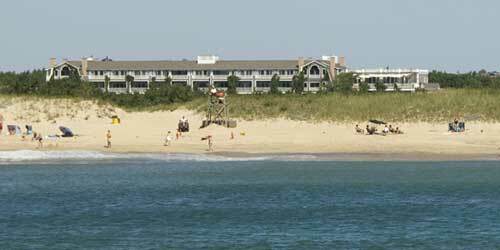 Recently named US News & World Report’s “Best Hotel on Martha’s Vineyard,” the Winnetu is conveniently located close to Cape Cod and offers studios; 1-4 bedroom suites; cottages; home rentals & ocean-view restaurant, The Dunes. 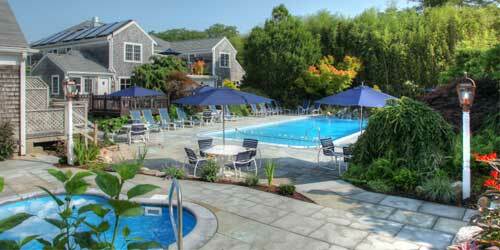 Complimentary shuttles to Edgartown, new heated pools and hot tub, Children’s Programs, tennis, yoga & more. Plan your Massachusetts beach Resort vacation at both the Winnetu and The Nantucket Hotel & we’ll transport you door-to-door between the islands and our Resorts. Perfectly positioned between Nantucket town and great beaches and private enough for peace and quiet, Brant Point Courtyard has the feel of a hotel and the comforts of a more relaxed vacation style. Fourteen units, including a one bedroom, a one bedroom cottage and a one bedroom two floor townhome come with every amenity you’ll need. Fully stocked kitchen with dishwasher; living room; 1, 11/2, or 2 baths; bath and bed linens; on site free laundry; gas grills; family areas; and a favorite of island visitors; an outdoor shower. Some units may also have hardwood floors, whirlpool tubs, decks, patios, and fireplaces. Shopping, dining, horseback riding, hiking and sightseeing along historic trails and at historic sites offers our visitors the very best in Nantucket charm and adventure. Old worldly in its charm, architecture and sophisticated service, modern in its amenities and comforts, The Wauwinet has earned its distinction as Nantucket’s only member of Relais & Chateaux, signaling worldwide recognition for its superior service. Perched on the island’s northeast shore, with access to the harbor and the Atlantic, the boutique hotel’s 32 guest rooms and individual cottages are appointed with custom furnishings, some with gas fireplaces, all with spectacular garden or water views. But they also feature those touches that signal attention to detail: fresh wildflowers, hand-stenciled finishes, Pratesi linens. 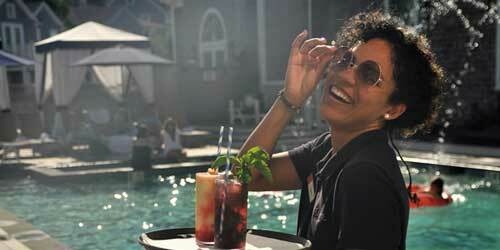 Guests can unwind at the spa, on lawn or deck chairs overlooking the Atlantic, or on private bay and ocean beaches. Dining is spectacular at award-winning Topper’s restaurant. Situated on a 3-mile stretch of sandy white beach stands the Nantasket Beach Resort, tall, white and brilliant with a sense of New England charm felt from the moment you arrive. 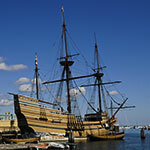 Close to Boston and the Cape, Hull is your gateway to historic Plymouth, and to New England's popular tourist attractions and historic sites. Here you can stay and play just steps from the beach. 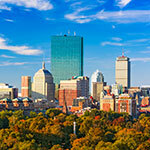 Enjoy spectacular sunrises and views of three of Boston's historic lighthouses. Full service amenities include Concierge service, our on-site restaurant, indoor pool, full fitness club, oceanfront conference center, and an array of excellent restaurants and attractions within walking distance, scattered among eclectic shops and boutiques. 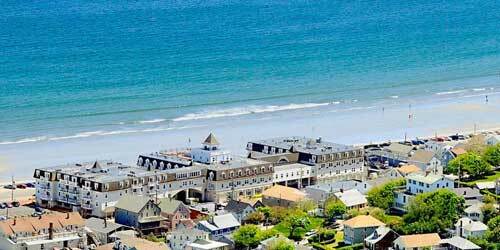 Enjoy the New England beach and waterfronts views just minutes from Boston. 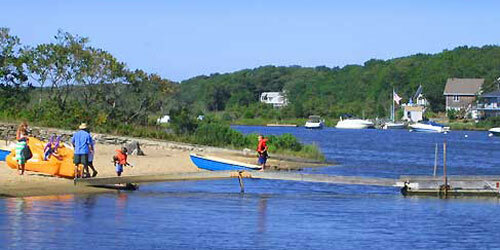 Surrounded by water on three sides, the picture-perfect town of Chatham beckons anyone who wants a vacation by the sea. And sitting on six lovely acres in Chatham is Pleasant Bay Village, where guests for years have been relaxing in the pool or their spacious rooms, getting in a game of shuffleboard or just sitting in the magnificent gardens. Water-based pursuits in Chatham include taking a day trip to Martha’s Vineyard or Nantucket, going deep-sea fishing, exploring a lighthouse or taking a water taxi to a secluded beach. 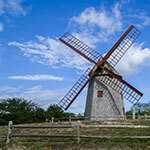 And you are only a short drive from the Cape Cod National Seashore and its fabulous beaches. The harbor, ocean and bay views on this part of the Cape are spectacular. And, p.s., so is the seafood! 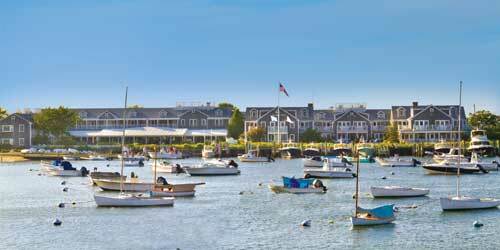 Book our Two-Island Adventure Trip: Stay at the Winnetu Oceanside Resort and our sister Resort in downtown Nantucket, The Nantucket Hotel. We’ll transport you door-to-door between the islands and our Resorts. Life revolves around the water at Nantucket Island Resorts. From most of the group’s inns, cottages and lofts, guests have harbor, bay or ocean views, and pristine beaches, a luxurious marina and sunset cruises are a walk or a bike ride away. Diners are in on the spectacular seaside scenery, from the deck of Topper’s restaurant at the Wauwinet to the harborside Brant Point Grill at the White Elephant Hotel. The sea also figures into the locally sourced cuisine, including Retsyo oysters cultivated a mere 300 yards from the Wauwinet. Noted for impeccable service and airy, comfortable rooms, resort properties, from the stately Jared Coffin House to the garden cottages of the White Elephant Village, are designed to make your island getaway unforgettable. 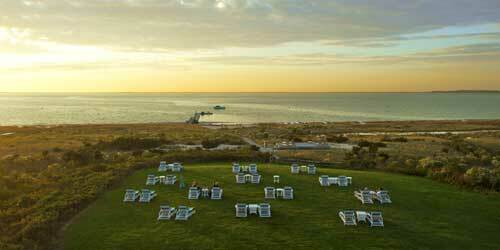 Relax, rejuvenate and let yourself be pampered at the luxurious White Elephant resort on scenic Nantucket island. Wake up every morning to the sight of the sea from your comfy room with contemporary coastal decor, watch the boats sail into the harbor from your table at the Brant Point Grill (a favorite with islanders), let the attentive inn staff help you plan a day bicycling around the island, cruising the harbor or exploring local galleries and boutiques. Or perhaps you just want to sink into a comfy lounge chair on the manicured lawn, sip a cocktail and watch the sun set over the water. Or settle down in the library with a glass of port to finally finish that novel. 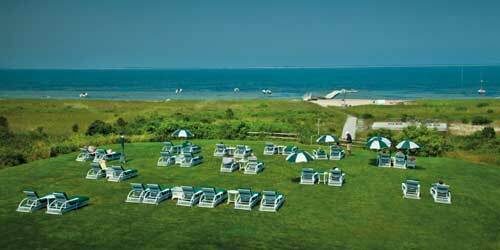 Located in historic Brewster, Ocean Edge Resort & Golf Club was named “Best Resort Cape Cod” by Boston magazine’s 2017 Best of Boston Awards, and offers stunning natural beauty and spectacular amenities. The Mansion at Ocean Edge features elegantly appointed guestrooms and two or three-bedroom villas with exclusive access to the Resort’s private beach, including towel and chair service. The Villages at Ocean Edge feature family-friendly one, two and three-bedrooms villas with all the comforts of home. All guests are welcome to enjoy the Resort’s 18-hole Nicklaus Design golf course, the new Beach House Spa, three restaurants, The Beach Bar, three outdoor and two indoor pools, nine tennis courts, fitness centers, bike rentals, and kayak and stand-up paddleboard rentals. 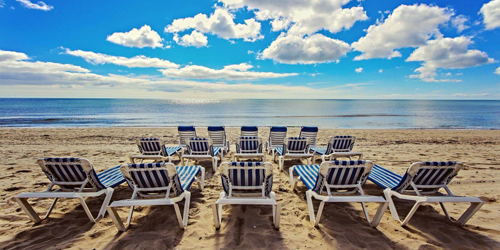 Set on the shores of Nantucket Sound in Dennisport are more than 400 feet of beautiful private beach and the perfect setting for a mid-Cape escape. Most of the 76 units at this year round resort - including studios and one & two bedroom suites - feature ocean views, a gas fireplace, and all include an efficiency-sized kitchen and wireless internet service. Guests step from their doorstep to the beach, indoor and outdoor pools, a fitness center and a seven-hole putting green. On site in summer are a bevy of great children’s activities with a wide variety of family activities in the surrounding local area. Name you fun – the ocean, the pool, great shopping, interesting museums, go-karts, ice cream, lobster rolls or golf - it’s all here awaiting your arrival. It’s all about the ocean at the historic Emerson Inn, which has been attracting rave reviews since the 19th century when its guests included Emerson and Thoreau, among others. Today, you may admire the ocean view while relaxing in the heated pool, enjoying a cocktail in the Grand Parlor, dining on the Veranda or sitting on the balcony of one of the resort’s elegantly appointed ocean view rooms. Or maybe, after dining at the charming Pigeon Cove Tavern, you just want to snuggle into an Adirondack chair on the spacious lawn and watch the evening sky turn pink. Nearby Rockport beaches range from the scuba-diver’s favorite Back Beach to the busy Long Beach, from which you can view Thacher Island’s twin lighthouses.